A convoy of vehicles with armed federal agents onboard from the US Department of Interior’s Bureau of Land Management (BLM) faced-off with the public at their protest camp near Exit 112, off of Riverside Road in Bunkerville, Nevada. The scene which took place this afternoon at 2pm PST, went violent after a detachment of federal agents pulled over and began threatening protesters and residents, before assaulting at least one woman and panicking and tasering protesters (see video below). PHOTO: Protesters and supporters of the Bundy family gathering off Riverside Road in Bunkerville, Nevada. A detachment of 12 federal vehicles and approximately 20 federal agents who were met by a band of residents and protesters parked along the shoulder of Riverside Road. Members of the public had asked the federal BLM to stop and answer questions regarding two vehicles in their convoy – a Backhoe digger and a dump truck, both of which are thought to be used by BLM forces to dispose of dead cattle. It has been confirmed by ranchers and observers that the BLM and federal “contract cowboy” agents’ aggressive practices of rustling herds and then taking the stolen the livestock for sale at auction in Utah. Witnesses have seen federal agent using multiple helicopters (image, below) forcing cattle to removal zones, sometimes uphill in 90F heat – a practice known to cause tremendous stress and exhaustion to the animals and causing them to die unnecessarily. It is believed that BLM agents are then scooping up the dead animals with Backhoe diggers, burying them right there in the desert, or disposing of them off site. In addition, one tragic result which has probably not been taken into account by BLM rustlers is the fact, reported by onlookers, that mothering cows who are being subject to these deadly federal tactics have been forced to leave their calves behind to hide in the desert bush (a common practice by mothers who are being rustled, who later backtrack to retrieve their young) putting them at risk of death as well. This shocking video was shot only a few hours ago, where following an assault on one 57 year old mother was violently thrown to the pavement by federal agents, BLM agents panicked and began threatening, and then tasering male and female protesters, and setting dogs on them. Watch as one defiant local resident, Ammon Bundy knocks off Federal taser wires (see his injuries here). The BLM made a decision last week to escalate its decades-long standoff against independent ranchers in Clark County Nevada, deploying a small army of around 200 federal agents, many of them armed, including snipers positioned along the ridges to ‘give cover’ to agents on the ground who are illegally rustling privately owned cattle – all in an effort to remove the remaining herd of 1000 cows belonging to rancher Cliven Bundy (photo, below). 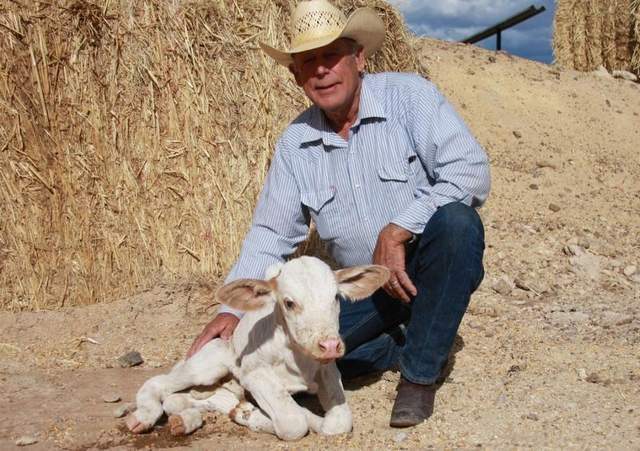 Nicknamed “the last man standing”, Bundy is the only rancher left who has endured a federal campaign of threats, harassment and exemplary fines over the years. Presently, he stands in defiance of a court order insisting that he remove his cattle from 600,000 acre public land – grazed by his and other families since the 1800’s, but land which has recently fallen into the BLM’s extensive property portfolio. The BLM have forced ranchers off of the land in Clark County because of environmental lawsuits filed by campaigners who claim that cows are threatening an endangered species of desert tortoise, despite the fact that there is no conclusive evidence that grazing livestock are driving the turtle to extinction.